Summary Three-stream 2,4 GHz and four stream 5 GHz AC class router with gigabit Ethernet ports, USB storage sharing and MU-MIMO support. ASUS' RT-AC68 has had a long run. It is one of the company's best-selling wireless routers, available in multiple flavors to appease consumer electronics retailers who want to confuse consumers the same way mattress stores traditionally have. In the quest to keep cash registers ringing, ASUS is following a similar route taken by NETGEAR with its R7000P, by refreshing the design with Broadcom's newest AC radios and a faster CPU. But to bump its "class" number higher, ASUS has given the 86U a 4 stream 5 GHz radio instead of matching the three streams on the 2.4 GHz side. Like the AC68, the AC86 will also sell under the aliases shown in the FCC document excerpt below. 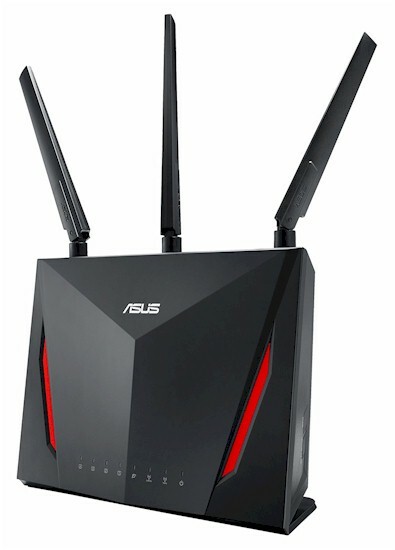 ASUS has stuck with the stand-up only design shared by the AC68 series, but swapped the diamond-pattern front styling for a cleaner angular style with red accents. The callouts below show a similar set of front panel LEDs and rear panel connectors. The right side also still sports WPS and Wi-Fi On/Off buttons. Never one to be outdone, ASUS is one-upping NETGEAR by seeing NETGEAR R7000P's change from AC1900 to AC2300 and raising an extra 600 Mbps to AC2900. The path to AC2900 is via the use of Broadcom's newer BCM4365E 3x3 radio SoC performing 2.4 GHz duties and its BCM4366E 4x4 radio SoC holding down the 5 GHz side. Since both support Broadcom's non-standard 1024 QAM, the inflated "class math" comes out to 750 Mbps for 2.4 GHz + 2167 Mbps for 5 GHz = 2917 Mbps, which ASUS has shockingly rounded down to 2900. ASUS has made a smart move by increasing the number of 5 GHz streams, which should help improve performance in that band. But precious few devices—ASUS' PCE-AC88 PCIe desktop adapter being the most notable—support 1024 QAM and you need very strong signals to reach the advertised maximum link rates. So for most of us, the AC86 should be considered AC2300 class with maximum link rates of 600 Mbps in 2.4 GHz and 1733 Mbps in 5 GHz with devices that support 256 QAM. But don't confuse this AC2300 with the NETGEAR R7000P's inflated AC2300, which is really AC1900. Can you see why I've stopped ranking products by wireless "class"?! Here's the RT-AC86U board with heatsinks and RF can tops removed. It's a pretty clean design, using RF front ends vs. power amps and their associated switches and LNAs. Here's the top view of the original RT-AC68U board. A glance at the left-side area above the two radio SoCs illustrates my point about the AC86's cleaner RF front end. If you were paying attention, you might have noticed an extra little white rectangle near the center antenna on the topside photo. That's the RF front end for the fourth 5 GHz transmit/receive chain. The photo below shows where the fourth antenna is hiding. Here's the component summary with the AC68U and NETGEAR R7000P included for comparison.